A few years ago, I managed a team at DocuSign that was tasked with re-writing the main DocuSign web app which was used by tens of millions of users. The APIs didn’t exist yet to support our new shiny front-end app because since the beginning the web app was a .NET monolith. The API team in Seattle was taking the monolith apart and exposing RESTful APIs slowly. This API team consisted of just two engineers and had a release cycle of one month. Our front-end team in San Francisco released every week. The API team release cycle was so long because a lot of (almost all) the functionality had to be tested manually. That’s understandable. It was a monolith without proper automated test coverage after all—when they modified one part, they never knew what can go wrong in other parts of the application. The Practical Node.js, 2nd Edition print book is finally ready. It turned out the biggest thickest book I ever wrote (500+ pages). Practical Node, 2nd Ed. is even thicker than React Quickly. My publisher Apress did a great job with design. They printed in color which means readers can see colored code, colored pictures and colored everything. This is never heard of in tech publishing (in my humble opinion). 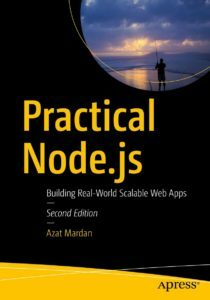 Practical Node is the same book that was the top seller on Amazon when you search for “node.js” for many many months. Now this book is updated and better with THREE more new chapters and all code in ES6+. I got only 10 free author copies from the publisher but they are awesome (pics below). If you want to buy from Amazon, here’s the link: https://amzn.to/2QsUucg. You can also buy digital and print directly from Apress: https://www.apress.com/us/book/9781484230381. If you prefer to free books, then here’s the (unedited) “open source” manuscript on GitHub (also code is colored): https://github.com/azat-co/practicalnode. I’m sure you can find PDF on torrents too. Give your eyes some rest from screens and get yourself a nice print Node book for holidays! This entry was posted in Book, Node.js on December 23, 2018 by Azat. I use IntelliJ IDEA to write Java code almost every day now. You might be curious what happened? This entry was posted in Node.js, Personal on May 3, 2018 by Azat. Node.js: Learn from the guy who wrote the book—actually, 14 of them! If you’re a software developer with a few years of experience, and you’re new to Node.js or web development, join popular instructor Benjamin Lin and author and founder of Node University Azat Mardan for Introduction to Node.js, now available on edX. In just a few hours (and using the latest materials), make the leap from desktop apps, and see how easy and fast it is to get started on Node.js. Plus, who better to learn from than the always-entertaining Benjamin and his colleague Azat, who has written more than a dozen books on Node.js? This entry was posted in Education, Node.js and tagged express.js, MongoDB, node.js on November 21, 2017 by Azat. Node Foundation published an enterprise case study about Node.js usage at Capital One. The title “After Call For Innovation from C-Suite, Node.js Pops Up All Over Capital One” and you can download the full case study from nodejs.org. This entry was posted in Node.js and tagged node.js on June 17, 2017 by Azat. It’s finally here. Node v8 which is based on Chrome V8. Got the pun? Haha. For full list of changes, check Node’s blog. Faster… like 5x times faster! More changes on npm’s blog. Upgrade npm to npm v5 with “npm i -g npm@latest”. If you get Node v8, then npm v5 is already bundle in it. This entry was posted in Node.js on June 1, 2017 by Azat. I went to Node Interactive Europe which happened in September in Amsterdam, the official Node conference—the real deal. Organizers invited me to present on React, so I taught a workshop on Universal Web, and also participated on a panel discussion about containers and Node with folks from nearFrom, IBM, Zeit and Netflix. You should watch the panel recording on YouTube. It was a good one. This entry was posted in Node.js on September 23, 2016 by Azat. In the previous post, we learned how to perform HTTP/2 server push in a Node server. We also covered the benefits of server push there so to avoid duplication we won’t list them here. We used spdy for server push and H2. But most of the times Node developers don’t work with core HTTP server, they use a framework like Express. So let’s see how we can implement server push in Express. This entry was posted in Node.js, Tutorials and tagged express.js, http2, node.js on September 14, 2016 by Azat. HTTP2 is the first major upgrade to the good old HTTP protocol in over 15 years (first HTTP is circa 1991)! It is optimized for modern websites. The performance is better without complicated hacks like domain sharding (having multiple domains) or file concatenation (having one large file instead of many small ones). This entry was posted in Node.js, Tutorials and tagged express.js, http2, node.js on July 8, 2016 by Azat.